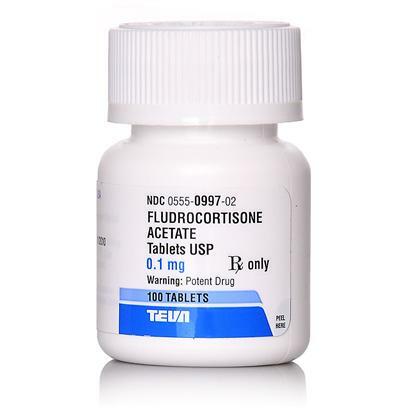 Fludrocortisone acetate is a synthetic corticosteroid that is used to treat adrenocortical insufficiency (Addison's disease) in dogs and cats. It has both glucocorticoid and mineralocorticoid activity, and it is a stronger mineralocorticoid. Its potency is 125 times that of hydrocortisone. Fludrocortisone acetate may also be used as an adjunct to the treatment of hyperkalemia. Fludrocortisone acetate is a mineralocorticoid, a hormone that helps to regulate the concentration of sodium and potassium in the body. It is used to treat Addison's disease (adrenocortical insufficiency, hypoadrenocorticism). This condition often requires life time treatment. Fludrocortisone may also be used to lower the potassium level in animals with hyperkalemia (high blood levels of potassium). Side effects are frequently a result of chronic, subclinical overdosage. Some dogs may develop polyuria and polydypsia. These dogs in particular may need a re-evaluation of their glucocorticoid status. Contact your veterinarian if your pet experiences increased thirst and urination, fluid accumulation in the limbs, weakness, or weight gain while being treated with fludrocortisone. Fludrocortisone acetate and amphotericin B: increased likelihood of hyperkalemia. Fludrocortisone acetate and potassium depleting diuretics (furosemide): increased possibility of developing hypokalemia. Fludrocortisone acetate and aspirin: reduced salicylates levels. Dosage is adjusted based upon blood levels of electrolytes.